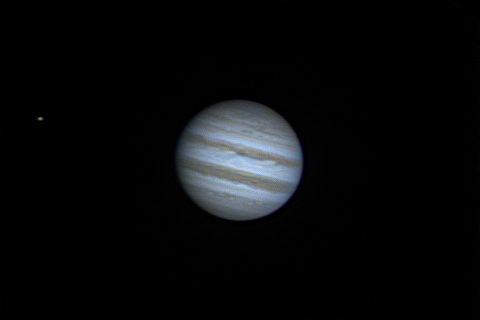 On 15th April, I grabbed a new shot of Jupiter with the ASI120MC, which as surpassed everything I’ve ever done on this amazing planet up until now. This really shows the difference that better seeing makes. This image was taken as the best 4000 of 8000 frames taken with the ASI120MC at around 75fps (using a ‘region of interest’ – basically only capturing the very centre of the frame so that the surrounding empty space (which isn’t needed) is not pulled down the USB cable. This allows much higher frame rates). 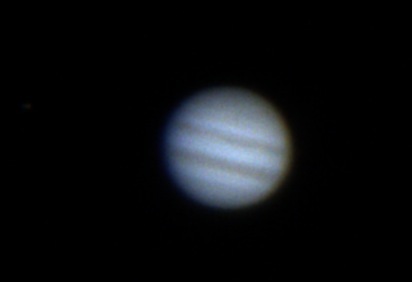 Taken through the 8″ F/6 Newtonian, with a 2.5x Revelation Barlow lens. Seeing is the term astronomers use for the stability of the air. When the seeing is bad, the air is turbulent, and so its difficult to make out fine detail on objects. When the seeing is better, the air is more stable, resulting in a better image. The processing techniques that we use to get images of planets try to get around this by taking the best bits of thousands of frames of video, and combining them into the sharpest image possible. Often the difference between the original video that’s taken and the final result of processing can be astounding. All I can say is WOW. The detail is beyond what I ever thought would be possible with an 8″ telescope. The sheer amount of detail is far beyond anything I’ve ever produced of this, the largest of the planets in our solar system. Unfortunately that night, the Great Red Spot (GRS) was nowhere to be seen, hiding as it was around the other side of the planet. Jupiter rotates extremely fast (only 10 hours to do a full rotation). This fast rotation also means that capturing more than about 2 minutes of video makes the surface detail star to ‘smear’. There are ways around this with a process called ‘derotation’, but I am yet to try it. to be honest, I managed to capture 8000 frames in approximately a minute and a half, so I’m not sure it’s even necessary! I’ll be writing up a review of this camera soon, but suffice to say, I’m amazed at what it’s churning out so far…!